LEGO Friends teamed up with Alex’s Lemonade Stand Foundation last week to build the world’s largest LEGO lemonade stand to help fight childhood cancer. In conjunction with National Lemonade Day, the team accompanied by approximately 5,000 children and parents met in front of Philadelphia’s National Constitution Center and assembled over 100,000 new LEGO Friends pieces to build a giant lemonade stand. Building the stand was LEGO’s way of encouraging children nationwide to make 2012 the largest and most successful Lemonade Stand benefitting Alex’s Lemonade Foundation. LEGO chose to use the new LEGO Friends line since their new collection is geared towards girls and they wanted to celebrate young girls like Alex and their creativity. In 1996, shortly before her first birthday, Alex Scott was diagnosed with neuroblastma, a type of childhood cancer. 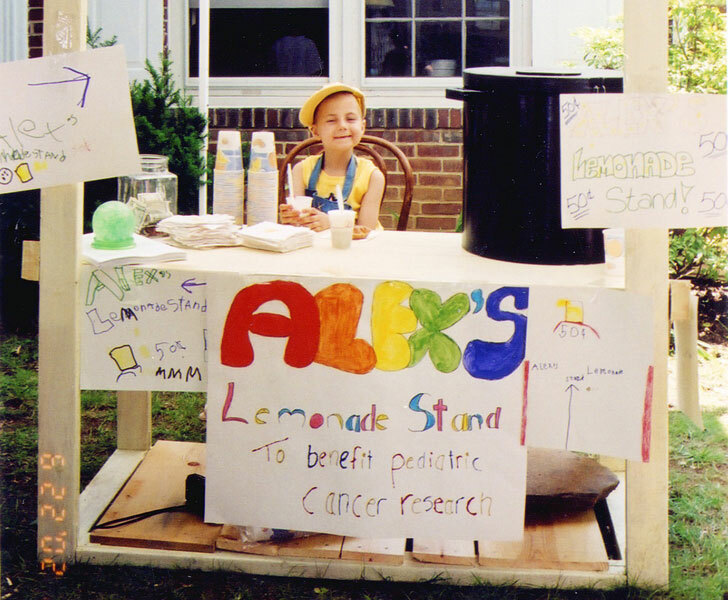 While recovering from treatment in 2000, Alex told her mom that she wanted to hold a lemonade stand to help doctors find a cure for childhood cancer. Later that year Alex kept her word and held a lemonade stand raising $2,000. While still battling cancer, Alex continued raising money through the lemonade stands raising a total of $1 million dollars to help find a cure for childhood cancer. Sadly in August 2004, Alex passed away at the age of 8. But that hasn’t stopped the foundation. Keep reading to see a video of the LEGO lemonade stand. Jay and Liz Scott, Alex’s parents, helped build the LEGO Lemonade Stand and placed the last bricks onto the stand. If you want to help, visit Alex’s Lemonade Stand Foundation to learn what you need to do to hold your own lemonade stand to help fight childhood cancer. You can also visit LEGO for instructions on how to create a LEGO lemonade stand to add to any LEGO town collection. LEGO Friends teamed up with Alex's Lemonade Stand Foundation�last week to build the world's largest LEGO lemonade stand to help fight childhood cancer. In conjunction with National Lemonade Day, the team accompanied by approximately 5,000 children and parents met in front of Philadelphia's National Constitution Center and assembled over 100,000 new LEGO Friends pieces to build a giant lemonade stand. Building the stand was LEGO's way of encouraging children nationwide to make 2012 the largest and most successful Lemonade Stand benefitting Alex's Lemonade Foundation.�LEGO chose to use the new LEGO Friends line since their new collection is geared towards girls and they wanted to celebrate young girls like Alex and their creativity.